Handmade 1L bottle copper Jack Daniels. 12v LED Light. U.K. Plug. 4.5W power consumption. 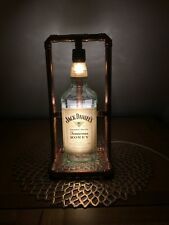 Handmade 1L bottle copper Jack Daniels. 12v LED Light. U.K. Plug. 17x17x33 cm. Lloytron 15 LED Storm Lamp Lantern Copper Garden Camping Handle Torch Description: This Traditional Style 15 LED Hurricane Lantern is ideal for use when camping, fishing, or BBQs and is handy for emergency use during power cuts etc. It features 15 superbright LEDs and has a dimmer control that allows you to control the level of brightness. It can be used freestanding or can be hung using the hanging hook on the top. It also has a convenient carry handle. Product Features: 15 super bright LEDs Lightweight and portable On/off switch with dimmer function to adjust brightness Requires 2 x D size batteries (not included) With carry handle and hanging hook Approx. dimensions: (Height) 23.5cm x (Diameter) 11.5cm. 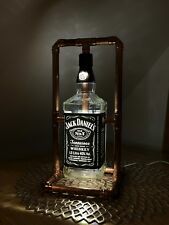 Jack Daniels Bottle Copper Retro Led Lamp 0,7l. Copper finish. 15 x bright long life energy saving LED's. If there's a problem, just let us know and we will fix it. Requires 2 x D batteries (not included). MATERIAL BREAKDOWN: 62% IRON 33% GLASS 5% HIGH. Here you?ll find the latest and greatest products. In other words ?. When you order from us, you?ll always get a great product at a great price. WEIGHT APPROX: 450G. We will always do our best to resolve any issues. Genuine & Authentic. Type: table lamp Frame: Steel Color: copper-colored Light color: warm white Voltage: 220 to 240 volts, 50-60 Hz . Copper finish. 15 x bright LED's. Long life energy saving LED's. This Modern Single LED Floor Lamp from the 'Phuket' range by Mantra Lighting looks great and is ideal wherever a modern look is desired. The Floor Lamp is Double Insulated. The IL-M4947 has a Copper / Anthracite finish. Bring modern and sparkling light to any space or decor. This Modern 5 Light LED Floor Lamp from the 'Giraffe' range by Searchlight Lighting looks great and is ideal wherever a modern look is desired. The 'Giraffe' range consists of matching Single Floor Lamp. 15mm copper water pipe led battery power desk lamp. Antique braided wire. 2 AA battery. Supplied. Curled copper bulb filament with led lamps. Glass bulb. Size approx. 12cm high, 12cm wide, 16cm high. Supplied with approx. 35cm antique braided wire. These are hand made, bespoke lamps & made to order, all sizes are approximate. No two items are the same. Natural copper finish- this is a natural metal product and it will tarnish with age, can be cleaned with metal polish. Please allow 5/6 days processing. Material: metal, copper Color: black, matt counter Cable length: 180 cm LxWxH: 24.6 x 22 x 143 cm . Made by: Lloytron. Copper finish. Integral carry handle. 15 x bright LED's. Long life energy saving LED's. Northern Ireland, Channel Isles. Release Date: 17/08/2015. This Modern Single LED Floor Lamp from the 'Giraffe' range by Searchlight Lighting looks great and is ideal wherever a modern look is desired. The 'Giraffe' range consists of matching 5 Light Floor Lamp. Part Number D1201CP. Copper finish. 15 x bright LED's. Long life energy saving LED's. Integral carry handle. Requires 2 x D batteries (not included). Robust and weatherproof. Interested in becoming a vendor?. This Modern Double LED Floor Lamp from the 'Phuket' range by Mantra Lighting looks great and is ideal wherever a modern look is desired. The Floor Lamp is Double Insulated. The IL-M4943 has a Copper / Anthracite finish. Material: Chrome Color: nickel-matt Lampshade: Glass with copper cable D balls: 9 cm Lxwxh: 67 x 28 x 19 . 2 DIM buttons to adjust the brightness. [easy to operate, easy to carry] plastic copper wire allows you to shape any shape you want to decorate. Each is 50 illuminated miniature LEDs and 16.4 feet in length. Bottle stopper material: Plastic shell. Give out shiny light to enhance party atmosphere. Lamp bead quantity: 20. Light string length: About 190cm. 1 Light string. Light color: red. Great decoration for bars, KTV or parties with its colorful light. Lamp type: Ceiling lamp Material: chrome, glass Colour: chrome Lamp shade: clear Protection class IP20 . Type: wall light Color: Copper colored Lights up and down Protection class: IP20 Dimensions: HxB in mm, 165x110 . Lamp type: LED RGB ceiling lamp Frame: Metal Lampshade: Glass, mirror glass Dimensions height in cm: 8.5 Weight: 1321 g .